A new day, a new Chaos god to showcase! Today it's the turn of the Lord of Battle himself: Khorne. 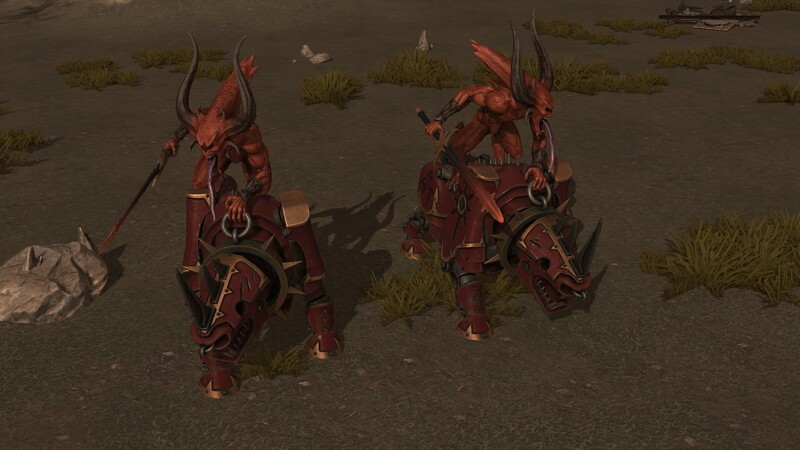 The Bloodletters form the core of the vast legions of the Lord of Battle. Believed to have been foremost amongst the Blood God's followers in mortal life, their will is as implacable and blood-hungry as Khorne himself. Festooned with rippling muscles, knotted sinews and driven by an unparallel killing instinct, Bloodletters are fearsome opponents. 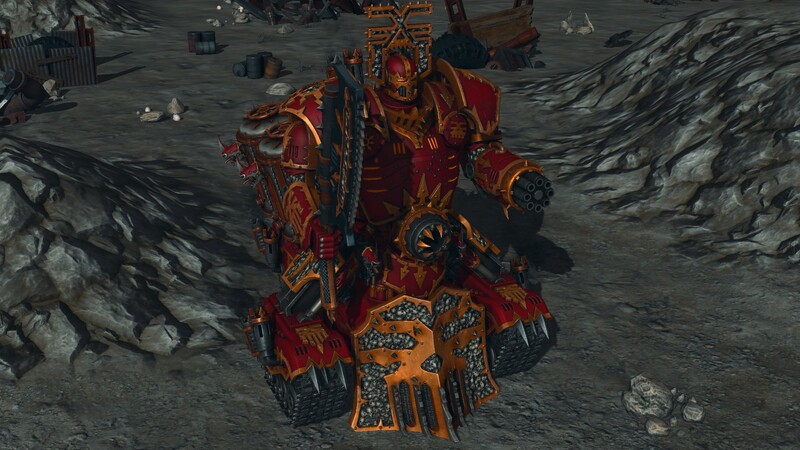 In Horrors of the Warp they are very tough melee units that can fill an anti-tank role. In fact their Daemonswords can cut through any armor. The Bloodcrushers of Khorne are heavy cavalry from within the Realm of Chaos, massive Juggernauts, ridden into battle by deadly Bloodletters. Beasts of brazen brass and corded muscle, Juggernauts are massively resilient and incredibly strong - their charge powerful enough to smash any battleline in a single earth-shattering stampede. While the mighty Juggernauts trample and gouge at their foes, the Bloodletters whirl about them with their bloody hellblades, claiming ever more skulls for their rage-filled patron Khorne. In gameplay terms they can play havoc behind enemy lines, with the toughness to operate as lone attackers and enough attack power to deal the finishing blow to all but the most elite units. 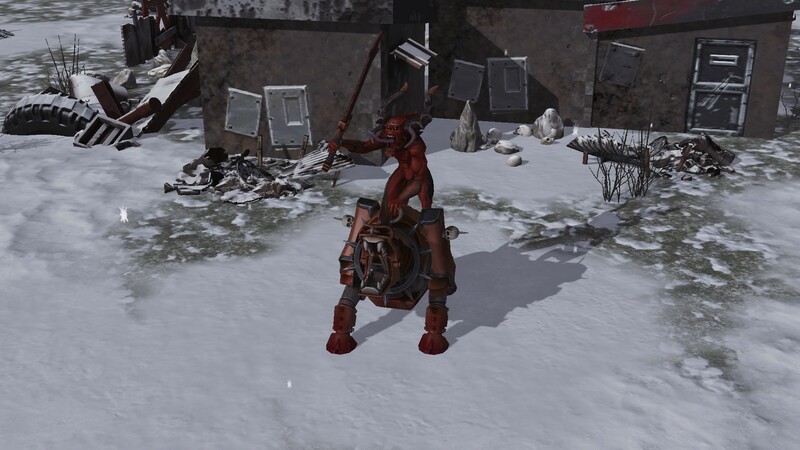 The Herald asserts his will over the Juggernaut as a mortal would over a more earthly steed. Such a pairing is far deadlier than the sum of its parts. Should a foe survive the frenzied biting and goring of a Juggernaut, they are likely to be crushed beneath its brass body or cut down by the Jugger's rider. With extremely high combat skill, attack power and maneuverability the Herald of Khorne specializes in assassinating high value targets, he is particularly good against enemy hero units. A powerful unit which specialty is, of course, killing. This massive Daemon Engine of Khorne is built in hell forges with the sole purpose of killing, maiming and burning its enemies until they are no more than a sticky paste under its mighty tracks. It is a pure infernal force, one which will sweep away any opposition. If you see a Lord of Skulls on the battlefield, you'll need to throw everything you have at it, and then more. And even then it might not be enough. It carries among the most powerful weapons in the game. Its devastating arsenal begins with the Hades Gatling Cannon, a long range anti tank weapon that is equally good against heavy infantry. Next we have the the Ichor Cannon, an extremely large flame weapon, capable of wiping out an entire army on its own. Finally it has a massive Great Cleaver of Khorne, giving it the most powerful melee attack in the game.